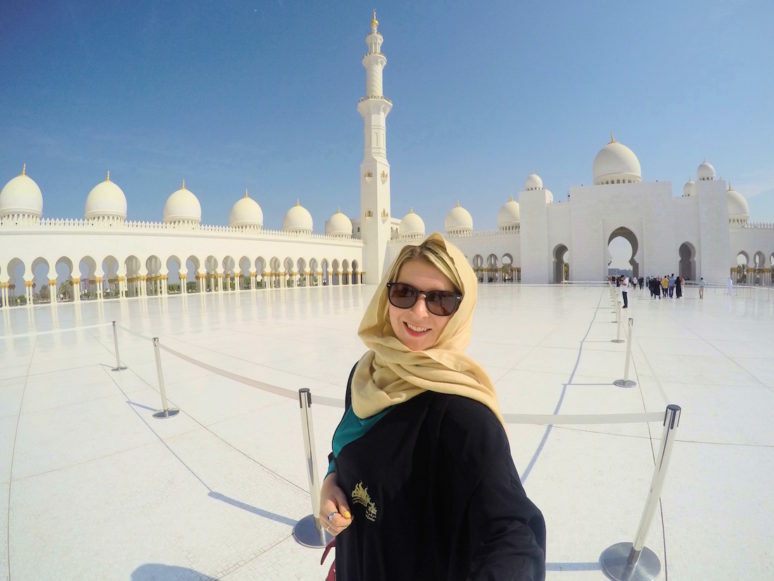 If you find yourself in the United Arab Emirates then a visit to Abu Dhabi’s Grand Mosque – Sheikh Zayed is a must because it’s certainly the Grandest Mosque I’ve ever seen and to be honest it’s worth planning a trip to the UAE just to see it! 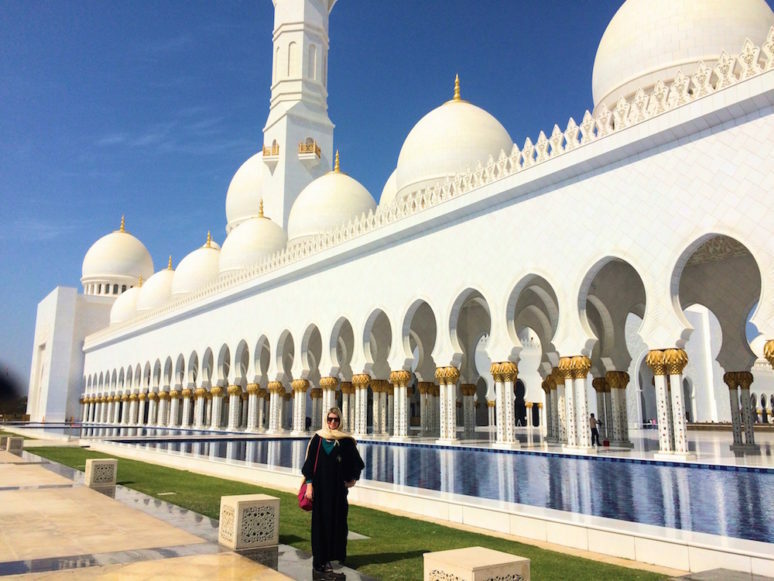 I visited the Sheikh Zayed mosque in November 2015 whilst I was in Dubai so here are 9 tips and pieces of information to help you plan your visit and know what to expect when you arrive. 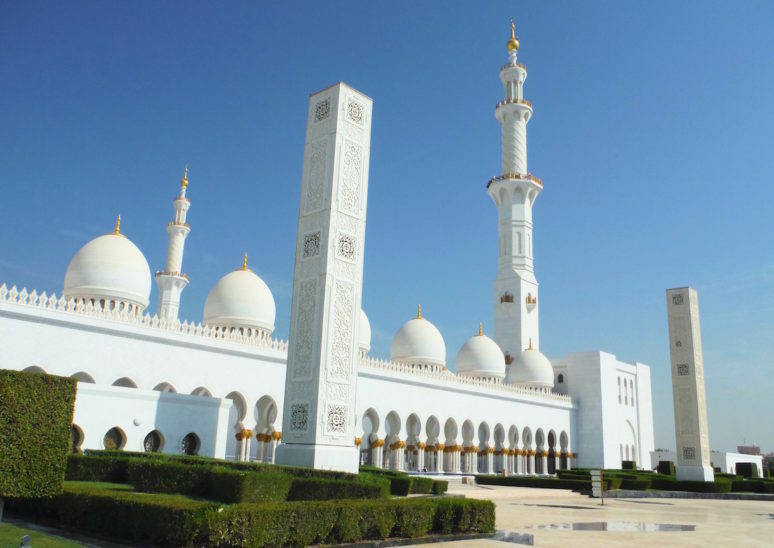 If you’re staying in Abu Dhabi you’ll find it very easy to get to the Sheik Zayed Mosque by taxi, however if you’re staying in Dubai which is 150km away then do not let this put you off going! When I was researching how to get to the Mosque from Dubai there appeared to be a bus that goes from Dubai bus station to Abu Dhabi bus station, however I couldn’t find much information on it and it would have involved getting 4 taxi’s either side of the bus so in the end my friend and I decided to get a taxi for the whole journey. It took about 90 minutes each way and cost 250-275 AED (£45-£50) each way. Our taxi driver from Dubai had no issues with taking us there and there were taxis waiting outside of the Mosque when we finished who had no issues with taking us back to Dubai either and I can imagine they’re very used to it. If you are looking for some good hotel choices near the Mosque, I can recommend The Ritz-Carlton Abu Dhabi Grand Canal, The Fairmont Bab Al Bahr, or The Park Rotana Abu Dhabi. Again, when I was first researching how to get there and what we would do I thought we could get a coffee from somewhere before or after we visited or take a walk and see more of Abu Dhabi. On the map there is some greenery and water nearby, but once there we realised it didn’t feel like a very walkable area due to the many big roads so we ended up heading back to Dubai as soon as we finished. However looking at the map now it seem like there’s a Coffee Club across the road so you may well be able to get a coffee now! Unlike many tourist attractions, it’s completely free to enter so there is no reason to miss this beautiful mosque when you are in UAE! Opening times are 9:00am-22:00 Saturday-Thursday and 16:30-22:00 on Fridays. As with many destinations it’s worth visiting during the week to avoid crowds. But as you can see from the pictures the scale of the mosque, compared to the size of its visitors means you will not feel crowded there. 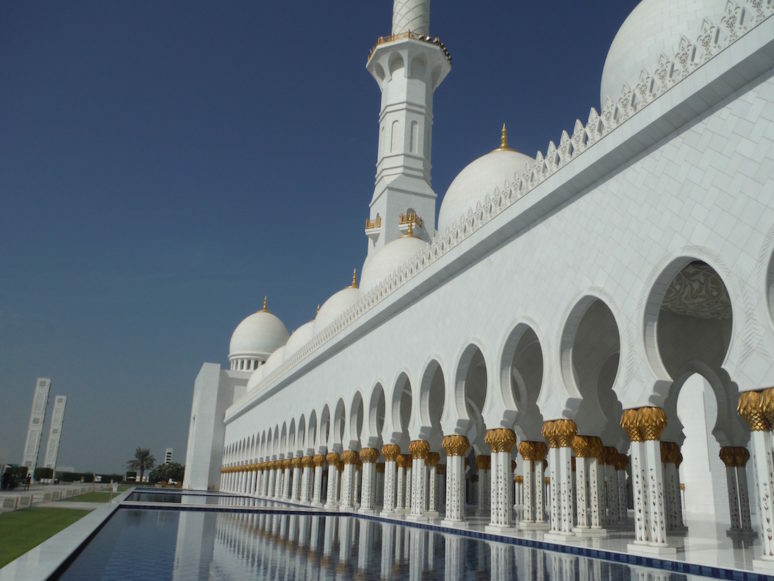 You’ll probably know if you’re in the UAE during Ramadan and if you are, note that the opening times change to 9:00am-14:00 Saturday-Thursday and the mosque is completely closed on Fridays. They also only offer tours at 10:00am on the days they are open. Any time of day is a good time to visit the mosque, however due to the heat you’re best visiting early morning or late evening. Also, if you’re into your photography then you might want to visit at sunset or just before sunset during golden hour as the photos I have seen from this time make the building look even more beautiful as the sun is shining off of it! As this is a Muslim site you do need to cover up and understandably they are very strict with the dress code. They do however provide women with a black Abaya free of charge which they have in a few different sizes. On arrival you are directed to a room where you change before entering the Mosque. *Update 2018: This review was written with information from 2015. Please double check that Abayas are available on the Grand Mosque website before you visit and ensure your own outfit is appropriate and includes a headscarf. I wanted to wear my own outfit so it looked nicer in pictures (my main concern obviously!) so I wore a loose black maxi dress and took a headscarf and something to cover my arms, but they weren’t happy with it and made me wear one of their Abayas anyway and I got the feeling they like everyone to wear them so you are fully covered. Therefore, I would suggest arriving with the attitude that you’re happy to wear one and if you want to add a bit of colour and style then bring along your own headscarf, otherwise you’ll have to use the hood of the Abaya. Also be prepared to take your shoes off and walk barefoot. You’ll probably have your sunglasses on you anywhere as you’re in the UAE, but make sure you do pack them as the white building and the strong sun can make it practically blinding! Free guided tours are available at various times during the day depending on the day. We got there just after the first tour started and didn’t want to wait for the next tour to start so we walked around on our own but I can imagine the tour would be very interesting and worthwhile! You can find the tour times on the official Grand Mosque website. 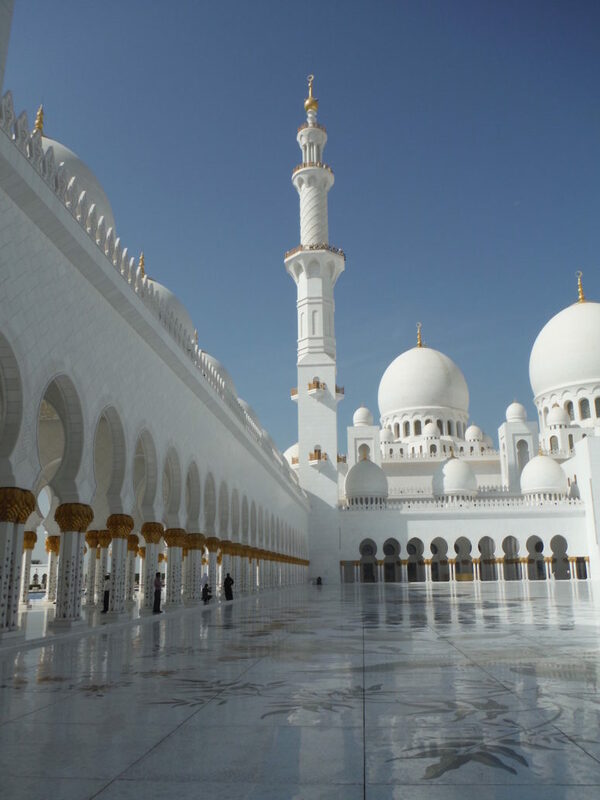 It really is an incredible building and one of the grandest Grand Mosque’s in the world! 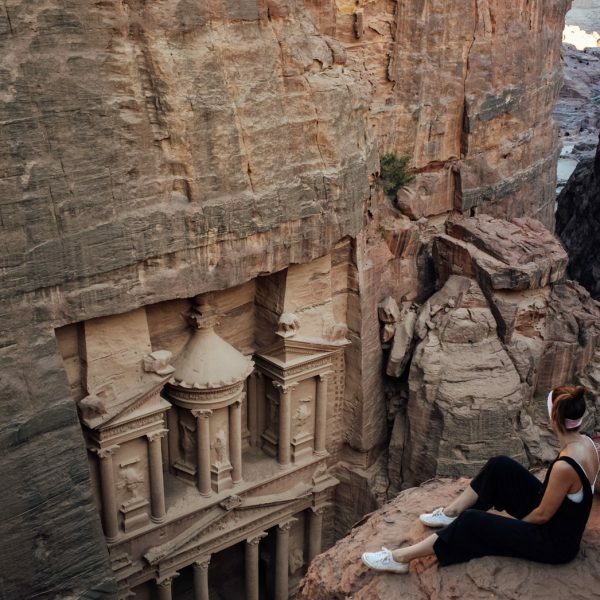 Enjoy the culture, learn something about the religion, take plenty of photos and be respectful. 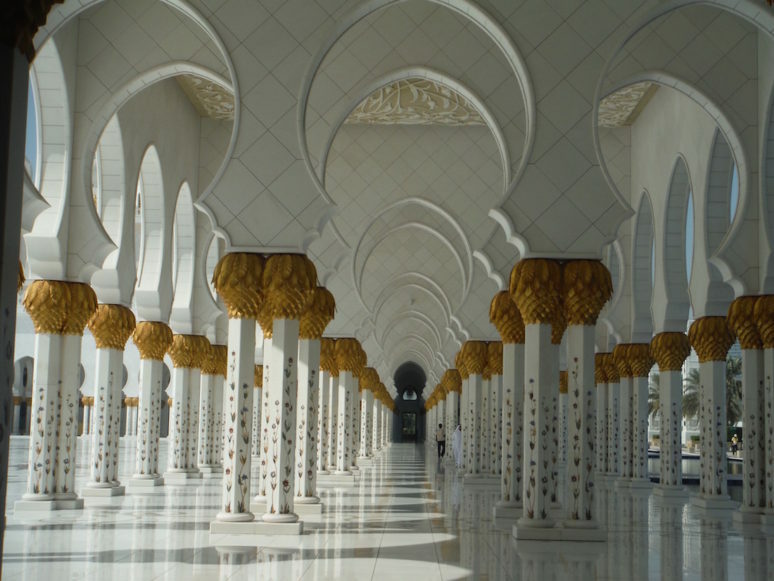 I hope that this article about the Sheikh Zayed Grand Mosque in Abu Dhabi has inspired you to visit this incredible piece of architecture. 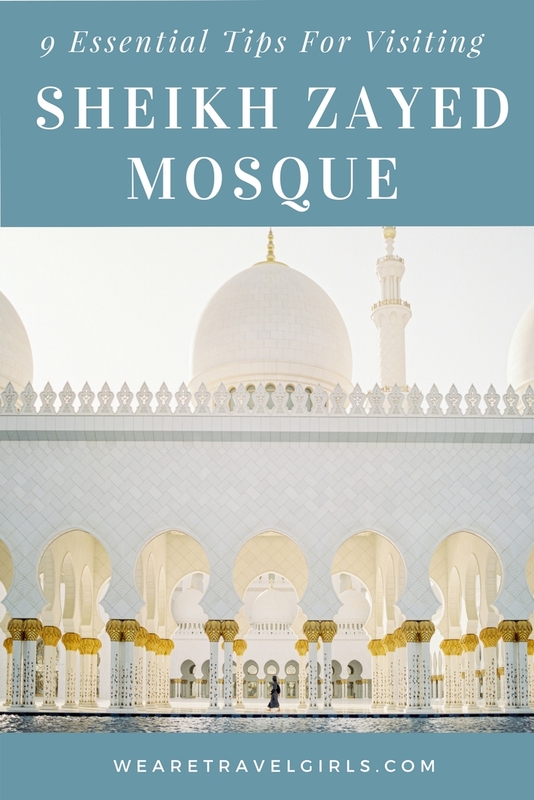 I hope this article helps you to plan your own visit to the Mosque. 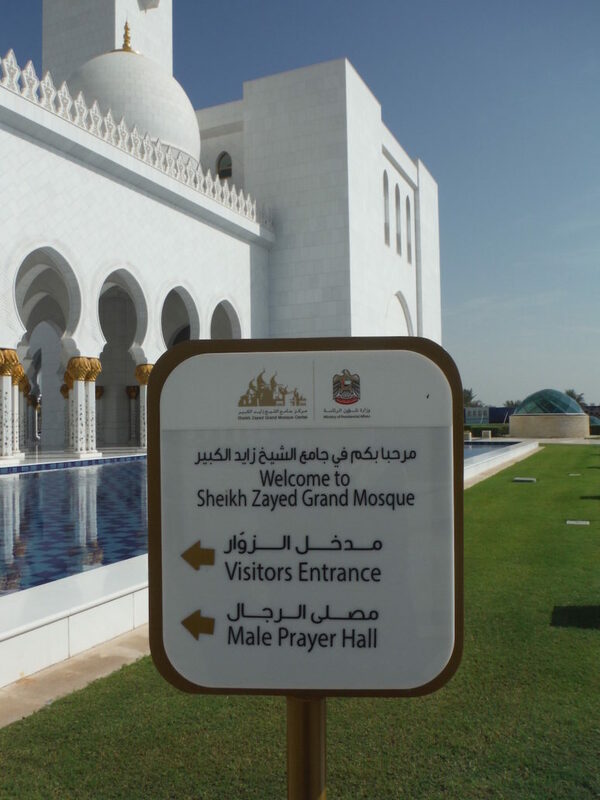 If you have questions, tips or updated information about visiting the Sheikh Zayed Mosque, please share them with readers in the comments. Getting back to Dubai from AD by bus, head over to the Al Wahda Bus Terminal. Two bus services are available, the same where you catch your bus going to AD. If you are staying close to Deira/ Downtown, catch the E100 Abu Dhabi to Bur Dubai/Al Ghubaiba bus station or E101 Abu Dhabi to Ibn Batuta Metro Station. Bus E100 drops off passengers at only 2 stops; at Al Jafiliya Metro Station (just after World Trade Center) and at Bur Dubai/Al Ghubaiba Bus Terminal. Do note that E100 buses leave every 30 mins while E101 buses leave every hour. It takes about 30-40mins from Ibn Batuta to say, Burj Khalifa. This is amazing, thank you! 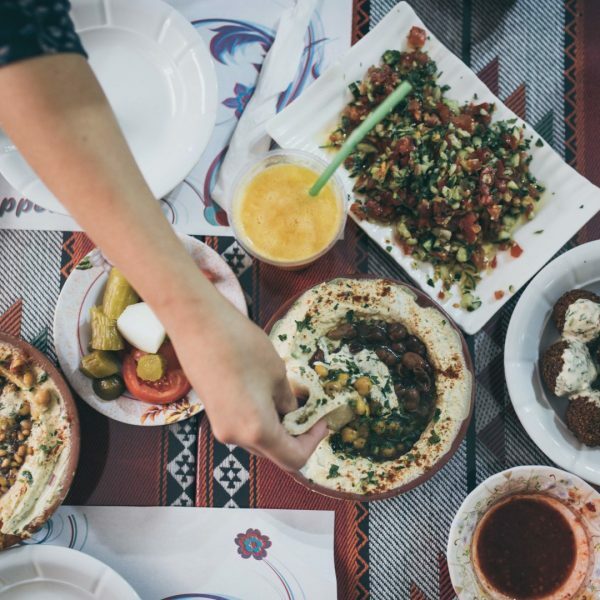 We are in the process of planning our trip to UAE and this information was super helpful. We are going during Ramadan so we are nervous about the Mosque hours and the crowd. The bus information is also very helpful. Which bus from Abu Dhabi to Dubai gets us closer to the Dubai mall? I figured that’s a good place to catch a taxi to our hotel. I’m also traveling to UAE during Ramadan. Thank u very much for these helpful tips as I was researching where to buy tickets, attire and get my transportation. Thanks Ellie for sharing the tips. 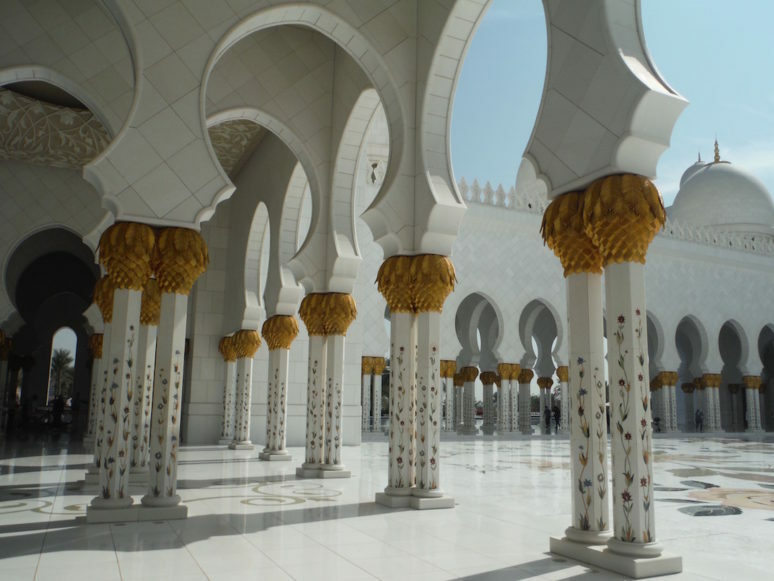 I have been in Abu Dhabi last year, however I was unable to visit this beautiful mosque. You have given me the reason to visit the emirates capital once again. beautiful pictures and very well explained blog. Looks like worth watching place. Thank you for reading and commenting Akshay, we are pleased to hear that Ellie’s post has inspired you to visit Abu Dhabi again! My family is traveling to Abu dhabi encounter to another country in May but we havw two dats in abu Dhabi cold you give me a few spots that are must see while there. 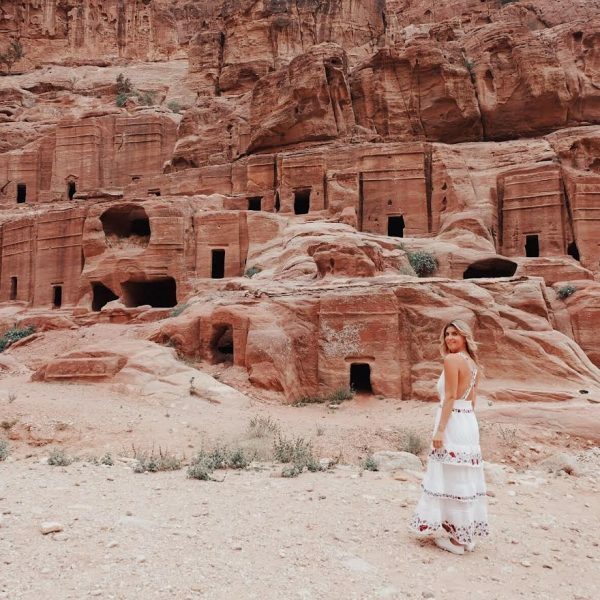 It is our hope to shop the souks but I want them to experience the culture too while there. Abu Dhabi looks more than decent to me. To be very honest, I was unaware of all these beautiful attractions. I have been in Dubai twice but never visited Abu Dhabi. I hope next, I will get a chance to visit this wonderful place. Thanks for sharing the blog. Thanks for reading and commenting Arif, so pleased that this post has inspired you to visit Abu Dhabi! When I visit the mosque, I would like to have the black abaya for rental. Can you request for it or how did you get the black? As I’ve seen there are other colours of abaya for rental as well. Thanks for the answer! It is really helpful and delightful because I am intend to visit this amazing building tomorrow. As this is the second time I am here and free to take a tour in Abu Dhabi, but still it is not a city I are familiar with. The most concern is that I do not know how to get back to downtown Abu Dhabi. But your lovely tips do help me out so I am comfort to go. Thanks for the sharing. Thank you for reading and commenting Riya! Thank you for sharing this! So hepful! We are planning our trip to Dubai and Abu Dhabi in the end of March and looking forward visiting this beautiful place. We’ll be staying in Dubai most of the time but planning to come to Abu Dhabi for one night, do you think is enough? I think an update is required here. I visited the Grand Mosque in Abu Dhabi today expecting to be able to get an Abaya. There were no Abaya’s available. On top of that, many people in our group were refused entrance as their clothes were too tight, showed wrists, ankles, see thru and the list went on. They are very strict and if I could offer advice / go prepared with your own attire. Completely covered neck to toes and fingertips. Loose not form fitting. Your hair must also be covered with a scarf. Men get away with much less but women there was no leniency at all. So much so the wind blew my head scarf off and security was on me to put it back on. So go prepared and dress yourself so there is no disappointments. Hi! Thank u for sharing this.. Im going to the mosque by taxi from my hotel in Dubai.. I was wondering if its easy to get a taxi back to Dubai from the mosque? As in, taxis are easily available outside the mosque? Will be waiting for your kind reply..
Sheikh Zayed Grand Mosque was initiated by the late president of the United Arab Emirates. His final resting place is located on the grounds beside the same mosque. The mosque was constructed from 1996 to 2007. The carpet in the main prayer hall is considered to be the world’s largest carpet. 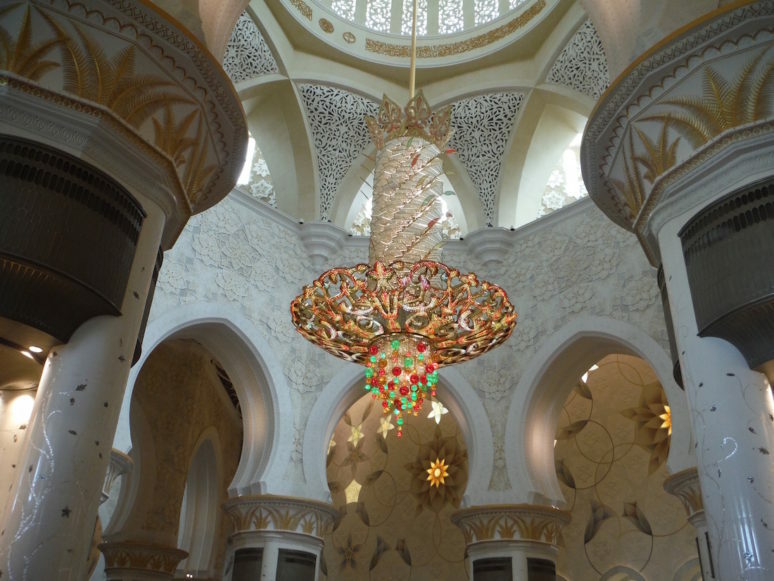 It also having third largest chandelier in the world inside.